PLEASE NOTE: WE DO NOT ACCOMMODATE WEDDINGS, PARTIES, REUNIONS, ETC. Come and experience this luxury 3,500 sq. 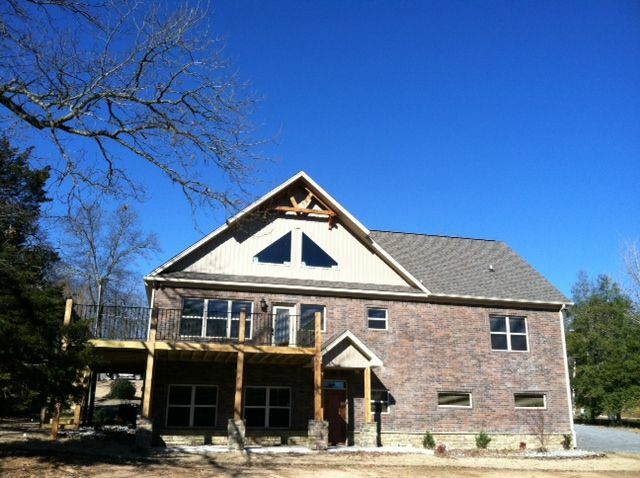 ft. waterfront getaway on the shore of Lake Hamilton in Hot Springs! Completed in 2012, this custom 2.5 story home greets you with sunlit views and warm, southwestern décor. You will appreciate the comfort of 5 king bedrooms, each its own bath, plus a queen sleeper sofa in both great room and game room. The spacious main level and upper/ atrium level will sleep up to ten, and the lower level sleeps an additional four comfortably. From the 20 foot high ceiling great room, designer furnishings, two completely equipped kitchens with stainless appliances, granite counters everywhere and tree-shaded deck, to the comfy king-size beds, Wi-Fi connection, flat-screen HDTVs and pool table, Lakeshore Lodge takes lake living uptown. You'll enjoy the quiet neighborhood, with spacious lakefront lawn that offers play equipment for your little ones and an in-ground fire pit for family marshmallow roasts. The quiet inlet is perfect for just floating and swimming; the 160 feet of private shoreline features a wide boardwalk for sunning or jumping in the water; and you have your own private boat launch to one side of the property, with space for your trailer. Best of all, you're minutes away from all that Hot Springs has to offer: horse racing, historic art galleries, hiking, fine waterside dining and pristine lakes for skiing, boating or fishing. This home is close to the action but miles away from ordinary! Includes side-loading two car garage and level off-street parking. See Rates section for information on rental. NOTE: We do not accommodate special events. (2) Large fully equipped kitchen on main level; smaller complete kitchen in game room; both have stainless steel appliances and granite countertops. (2) Large wrap-around deck off upper living area and master bedroom; tables w/seating for 8. A covered porch off the downstairs game room has table for four under a ceiling fan and BBQ grill area. Property is spacious 2.5 level lake home with luxurious southwest style furnishings; 2 flat screen HDTVs with DVD in great room and game room; 160 feet of shoreline with boardwalk, in-ground fire pit and play equipment; boat launch, swim/sun/ boardwalk area; five king bedrooms with private baths; a queen sleeper sofa in both the great room and game room; large upper deck with lake view and 2 tables for outdoor dining; easy to use propane gas grill. Lower level has game room with queen sleeper sofa, pool table with ping pong top, 55' HDTV; king bedroom with Jack & Jill bath; access to two-car garage. This house is wonderful to stay in with a big group. It has five king beds which is very hard to find anywhere. The owner is really easy to work with. Will definitely stay here again. We loved the house. It was perfect for our group. Especially liked the 5 king size beds in each room with bathrooms! We had a very comfortable stay. The home was well equipped as advertised. This property was perfect for our group getaway. The house was well laid out. Each couple had their own bedroom and bathroom. We played pool and ping pong, went fishing and just sat on the deck and enjoyed the beauty of the lake. Oaklawn Race Track; Garvan Woodland Gardens; Bath House Row and historic gallery/shopping district; direct access to Lake Hamilton and nearby access to Lake Ouachita; area golf courses; very private location within minutes of all activities. RESERVATIONS THAT INCLUDE A MAJOR HOLIDAY ARE ALL AT THE SUMMER RATE OF $475 PER NIGHT. Owner will provide a rental agreement which must be printed, completed and returned prior to approval of reservation. We do not accommodate weddings, parties, reunions, etc.